Koh Lanta Island on the map appears to be multiple islands, but it’s one island separated by small stretches of water. The perimeter around the main islands is about 120 km. and encompasses an area of 340 sq. km, with the main tourist part of the island being 21 km. long and about 4 km. wide. Koh Lanta is part of Krabi Province and is located just 14 km. west of Trang Province at its closest point. It sits next to the island of Ko Jum (also known as Ko Pu) which lies about 3 km. to the west at the northern most tip of Ko Lanta. Coming from Phuket Island and reaching Ko Lanta by ferry will take about four hours. Driving from Patong Beach will take you at least five hours on the road. There are roads throughout Koh Lanta island and it is fairly well built up for tourists, though nothing to the extent that Koh Samui is overbuilt. There are plenty of places to stay, restaurants and things to do. Beaches are spread out all over the island, but the best locations are all on the southwest side facing the open Andaman Sea. Ko Lanta has always been known as a backpacker haven and nothing has changed over the years, though there has been ongoing business development on the island. You’re no longer relegated to lower-end hotels and bungalows, there are now some higher-end properties you can book. You’ll be happy to find a public hospital (Ko Lanta Hospital), a post office, a Muay Thai gym, a couple of caves to explore and a waterfall on Ko Lanta. Many tourists come to practice yoga – there is a teacher at just about every resort on the island. Meditation is also in demand, and tourists and Thais alike are taught at the International Meditation Centre Ko Lanta headed by Thudong monk, Prakru Samuphanyot Junthako. There are bicycles for rent at many locations around the island. Most resorts will have at least a couple available. The roads are not so wide, and for other than short trips you probably should have a motorbike or rental car. You can bring a rental on the ferry between islands. Sea kayaking (sea canoe) is popular, and the best tour on the island, Talabeng Sea Kayaking, takes you to two islands on the northeast side of Ko Lanta where you can explore limestone caves. For the best snorkeling near Ko Lanta, check out Opal Speedboat Tours for trips to islands 27 km. south of Lanta named Koh Rok Nai and Koh Rok Nok. Alternatively, just bring your own equipment or rent it at your resort, to putter around in the waves by the beaches on any coast. – Pimalai Resort and Spa – as good as it gets on Lanta. This 5-star luxury resort is quite modestly priced and yet tops the charts for expensive digs on Lanta at around 5,500 Thai Baht per night. A tennis court, a spa, an immaculate swimming pools and great food make this worth the extra coin. Located on the southwest coast of Lanta Yai, just west of Khlong Chak Waterfall. – The Houben Hotel – Walter Houben created this adults-only, non-smoking hotel that is ranked highly with great reviews and for an average room price of around 3,000 THB. The free breakfast and meals at Red Alert Restaurant also get rave reviews. The owner Walter Houben and his family go to extremes to make your stay pleasant. Located on the southwest coast of Ko Lanta Yai. – Lanta Castaway Beach Resort – a budget option. This hotel gets great reviews and is located near other expensive resorts. Seaside bungalows on a nice wide beach at an affordable 1,200 THB room rate make this a good option for penny-pinchers. Located on the northwest coast of Koh Lanta Yai. – Tides Restaurant – Beach side tables on a wide white-sand beach with front-row seats to amazing sunsets make this the number one restaurant on Lanta for the discriminating traveler. Average meal cost for two is around 4,000 THB, and they serve Thai, European, gluten-free and vegetarian dishes. Located at the far northwest side of Ko Lanta Yai. – The Seven Seas Wine Bar and Restaurant – Serving seafood, Mediterranean and European cuisine with limited vegetarian options on a hill overlooking the beach and in a great place for sunset. Average meals for two is around 4,000 THB. Located on the southwestern tip of Ko Lanta Yai. From November through April the best way to reach Ko Lanta from Patong Beach or anywhere on Phuket is by taking the ferry from Rassada Pier to Saladan Pier in Lanta, in about four hours (8:30 am. to 12:30 pm.). Coming back from Lanta, ferries leave at 8 pm. and 1 pm. daily. 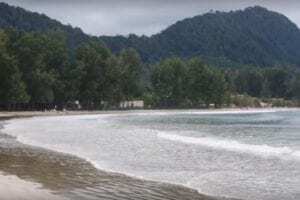 During the other months of the year the water may be too rough or at least not so enjoyable, so a white van or bus ride from Phuket to Ko Lanta may be the better option.